Mary Gardner, DVM, is cofounder of Lap of Love, the nation’s largest organization of veterinarians dedicated to end-of-life care in the home. Her goal is to increase awareness and improve medical care for the geriatric veterinary patient and to make the final life stage as peaceful as possible, providing dignity and support for all involved. A University of Florida graduate, she speaks regularly at national veterinary conferences. FUN FACT: Mary was a baton twirler in high school and loves really scary roller coasters. MANY SUCCESSFUL HIGH-ACHIEVERS, INCLUDING VETERINARY PROFESSIONALS, EXPERIENCE THE FEAR OF BEING CONSIDERED A FRAUD, BUT THERE ARE WAYS TO OVERCOME IMPOSTOR SYNDROME. The conference room is filling up, and I start to get nervous as the moderator introduces me—not because I am about to speak to hundreds of fellow veterinarians, which I love to do, but because I fear I will be considered a fraud. I start thinking of all the things I do not know and become paranoid that someone will ask me something that stumps me or I do not feel qualified to answer. I have to force myself to change the direction of my thoughts before I fall apart. I do know what I am talking about, I am good at what I do, and if there is something I do not know, it is okay. After all, everyone is here to learn! I begin my presentation and before I know it, 50 minutes have passed and I can hear applause. This is an example of Impostor Syndrome. Impostor Syndrome occurs when a person feels most vulnerable and has doubts about his or her confidence to perform the task at hand. The term Impostor Syndrome was coined decades ago by 2 American psychologists, Pauline Clance and Suzanne Imes, who described it as a feeling of unworthiness in people who believe they are not intelligent, capable, or creative despite evidence of high achievement.1 Many feel their success is due to luck or a fluke. The most common clinical symptoms are generalized anxiety, depression, lack of self-confidence, and frustration, according to Clance and Imes. Some researchers believe the syndrome is more pronounced in women3—who make up approximately 80% of graduating classes—which puts those in the veterinary field on the front lines. Many women do not take accountability for their knowledge. For example, they begin a sentence with I think to soften their tone or because they doubt their own expertise. Recognize your expertise and value: You got where you are today not by luck but through intelligence, hard work, studying hard, and overachieving. You do know what you are talking about. Your input has value to society. Concentrate on what you do well: No one is good at everything, nor can someone know everything. However, you can be a source of intelligence and talent for many things! Keep a list of your great accomplishments, the compliments people give you, and the accolades you receive. When in doubt, read the list to remind yourself of your accomplishments. Overconfidence is not the goal. Feelings of self-importance and perfectionism are building blocks for Impostor Syndrome, and learning to let them go helps reduce your fears and concerns about being considered a fraud. Realize that no one is perfect: You can strive for perfection, but know it is an unachievable goal. You can admire someone for his or her achievements but do not forget you have your own list of great qualities. Note that being wrong does not make a person a fake or phony. Eventually, even the best sports team loses a game. Know that failing is not a failure: Recognize that microfailures throughout life are learning experiences that can be overcome. More knowledge often is gained from failure than from success. Talk to those whom you respect: Many people likely respect you and can offer sound advice when you are unable to recognize your self-worth. Find a mentor you can rely on in times of self-doubt. Do not hold back: The world is lucky to have you. Do not hold back—make sure you are part of it! Seek help: Professional guidance and support can be extremely beneficial. Too often people think reaching out to a professional is a sign of failure, but it takes a strong person to seek help. Anxiety and depression are a real concern in the veterinary profession, and individual or group sessions can be life-changing. Every veterinary team member is knowledgeable, dedicated, understanding, and compassionate—a skill set many desire. 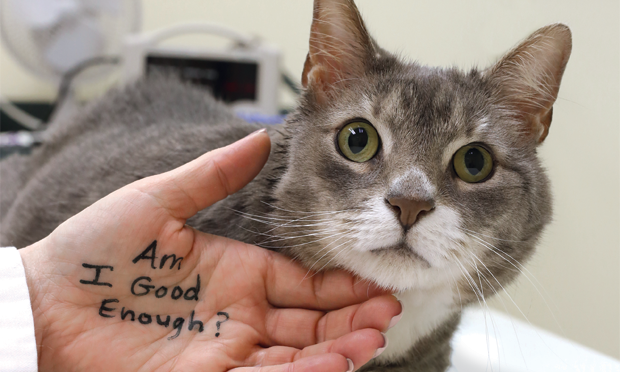 Impostor Syndrome may be more widespread than is generally recognized, even in the challenging veterinary profession, which can be an emotional roller coaster. However, knowing the tools that can help defeat Impostor Syndrome, and when to use them, will prevent being overcome by feelings of inadequacy. Clance PR. The Impostor Phenomenon: Overcoming the Fear that Haunts Your Success. Atlanta, GA; Peachtree Publishers; 1985. Ghorbanshirodi S. The relationship between self-esteem and emotional intelligence with Impostor Syndrome among medical students of Guilan and Heratsi Universities. J Basic Appl Sci Res. 2012;2(2):1793-1802. Clance PR, Imes SA. The impostor phenomenon in high achieving women: Dynamics and therapeutic intervention. Psychother-Theor Res. 1978;15(3):241-247. If you believe that any team members do not recognize their self-worth, act as a mentor to help them overcome their self-doubt. Veterinary nurses have special skills and do many things well. Make a list of your achievements and, when feeling a lack of confidence, read the list and remind yourself of your accomplishments. Client care team members are often on the front lines and need to act fast and to multitask. Know that achieving perfection is impossible and doing your best at all times is enough.